‘In 1935 – the founding year of Alcoholics Anonymous, Portuguese neurologist Egas Moniz introduced a surgical procedure into psychiatry that came to be known as the prefrontal lobotomy (recall One Flew Over the Cuckoo’s Nest). Drs. Walter Freeman and James Watts pioneered the use of this technique in the United States in 1936. By 1960, 100,000 psychosurgery procedures had been performed in the U.S. Patients targeted for this procedure included those judged to have “compulsive hedonias” – alcoholism, drug addiction, excessive eating and sexual deviations. The prefrontal lobotomy procedure severed the connecting nerves between the thalamus and the prefrontal and frontal lobes of the brain. Its intent was to induce significant changes in thinking and personality that could alter the course of intractable psychiatric illness. The total number of people with substance use disorders who underwent this procedure is unknown. 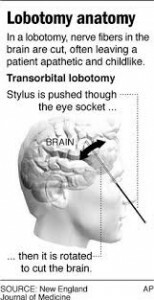 One could assume that the prefrontal lobotomy is one more chapter of “harm in the name of help” long ago cast into the dustbin of addiction treatment history in the U.S., but when exactly did use of this procedure stop? The following story suggests it may have gone on much longer than once thought.